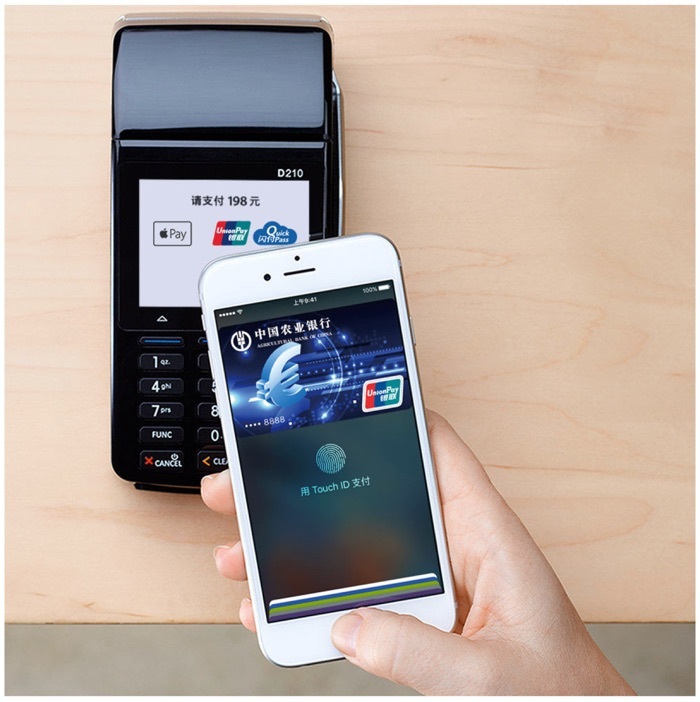 Apple Pay launched in China today, as Tech in Asia reported this morning. It’s not going to be an easy ride for Apple, since Chinese consumers are already used to online payments and in-store cashless transactions on their phones through WeChat and Alipay. Both those homegrown apps have had years to make a head start. WeChat, the popular messaging app that has a baked-in mobile wallet, and Alipay, the payments and local shopping app made by the Alibaba subsidiary, already have hundreds of millions of active users each month – 650 million on WeChat, 400 million on Alipay. And both services are now accepted at a huge number of stores across China. While Apple has made a wise move in partnering with UnionPay, the sole domestic bank card organization and interbank network in the country, not all stores have the latest UnionPay dongle – the one with NFC – attached to their cash registers. In other shops, however, it’s hit or miss whether older hardware attached to the cash register will stymie your attempt to use Apple Pay. I went for lunch today at Burger King and had to enter my card’s PIN after placing my iPhone near the UnionPay terminal and authenticating via Touch ID. Surely Touch ID should be sufficient. Not all transactions through Apple Pay will demand you tap in your PIN, but UnionPay’swebsite says it may be requested sometimes depending on the web connectivity of the cash register or your phone. I’ve never had WeChat or Alipay bug me for my PIN before. Alipay is not just a payments app – it’s also a shopping app full of deals and listings for local stores and restaurants. And WeChat is not just a messaging app with a mobile wallet – it also comes with an area devoted to useful services, including all the information from daily deals site Dianping, in which WeChat parent company Tencent has invested. 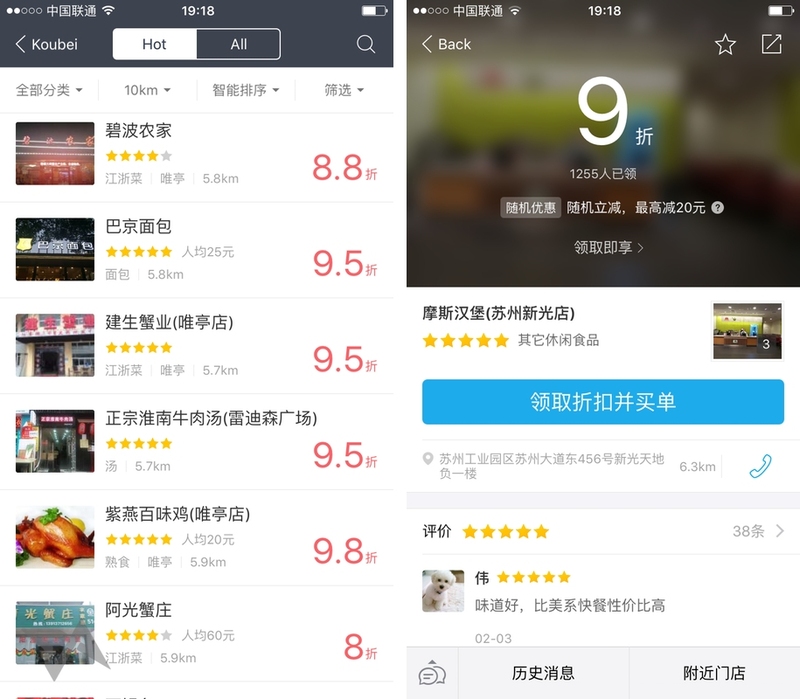 Inside Alipay app: (left) nearby restaurants offer discounts ranging from5 to 20 percent if you pay though the app. (Right) Mosburger offers a 10 percent discount. I should have gone there instead of Burger King – for that and other reasons. But Apple Pay and the accompanying Wallet app has none of that. In both Alipay and WeChat, you can seek out deals and discounts, or sometimes the bargains just come to you, with transactions occasionally costing less than you anticipated. When I spent an entire day going cashless in China, I got US$1 off my Costa coffee thanks to Alipay, and then US$1.10 off some socks I bought at Uniqlo. While those surprise subsidies from the Chinese tech titans won’t last forever, they’re a strong motivator to crack open the familiar WeChat or Alipay apps rather than use cash or a card. Put simply, Wallet is too simplistic. Compared to Alipay and WeChat, it’s very bare bones. Chinese consumers have repeatedly shown that they like very full-featured apps – ones crammed with info and deals and pictures and text and stuff to keep you coming back. Along with no discounts, Apple Pay looks set to be less visible in China. WeChat Pay and Alipay logos now adorn storefronts and pop up near the cash registers, but will Apple do the same thing in China? A sign by a cash register in a FamilyMart in China – nestled behind condoms and vibrators – shows that the store accepts cashless payments with WeChat Pay and Alipay. Although the UnionPay partnership boosts Apple’s availability, iPhone and Apple Watch users in the country won’t realize they can use those UnionPay terminals with their devices unless they’re seeing this news today.